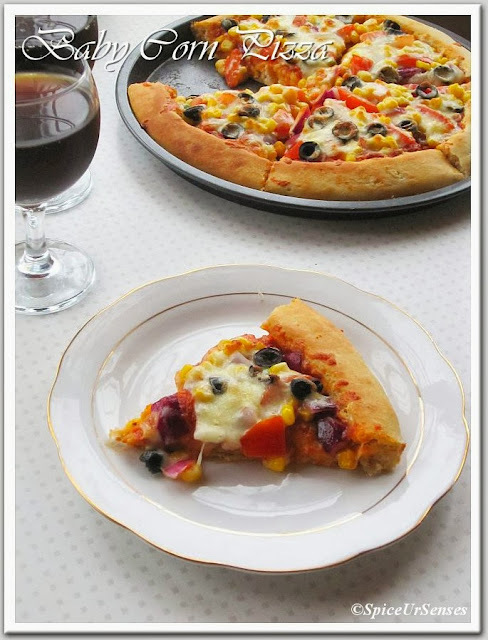 Baby Corn Pizza.. I had made this pizza for my friends on Monday, they liked it so much and we finished the large pizza in just 5 to 10 minutes. We three were eating like as if we have not eaten pizza for ages. The best part was, one of my friend was not at all allowing me to take the pictures also. I have hardly taken 4 to 5 pictures only. The moment I finished taking pics, she was the first one to jump on it and by seeing her I din't even bother to look at the pics and started eating... Some how the pizza also had come out very very tasty and awesome looking... Making pizza at home is so easy if you have pizza sauce ready and I always make pizza sauce and keep it. So when ever we feel like eating then I just make it. Making pizza at home is healthier then store bought... I want to suggest everyone start baking pizza at home and you'll really enjoy..
2tbsp oil, plus more for bowl. 12 ounces fresh mozzarella cheese, (grated). Pour warm water and milk into a small bowl. Add sugar, and sprinkle in yeast. Using a fork, stir the mixture until yeast is dissolved and water has turned a tan color. Let yeast stand until foamy, about 10 minutes. In a large mixing bowl, add flour and salt. Then add yeast mixture and oil. Mix until the dough comes together, adding more flour as needed until dough is smooth, not tacky, when squeezed. Transfer to clean surface; knead for 5 to 10 minutes. Brush the inside of a medium bowl with oil, and place the dough in the bowl, smooth side up. Cover tightly with plastic wrap, and place in a warm spot until doubled in size, about 1hour. Remove plastic wrap, and press your fist into the center of the dough to punch it down. Fold the dough back onto itself four or five times. Turn dough over, folded-side down, cover with plastic wrap, and return to the warm spot to rise again until the dough has doubled in size, about 30 minutes. Punch down the dough, and transfer to a clean surface. Knead the dough four or five turns into a ball. Lightly flour a clean surface, place the dough pat into a flattened circle, cover lightly with plastic wrap, and let rest 5 minutes. Using your fingers, begin to flatten and push the dough evenly out from the center until it measures about 7 to 8 inches in diameter. Do not press the dough all the way to the edges. Leave a slightly raised border, about a half-inch wide, around entire circumference of pizza dough. In a mean time pre-heat the oven for 20 minutes at 250c. 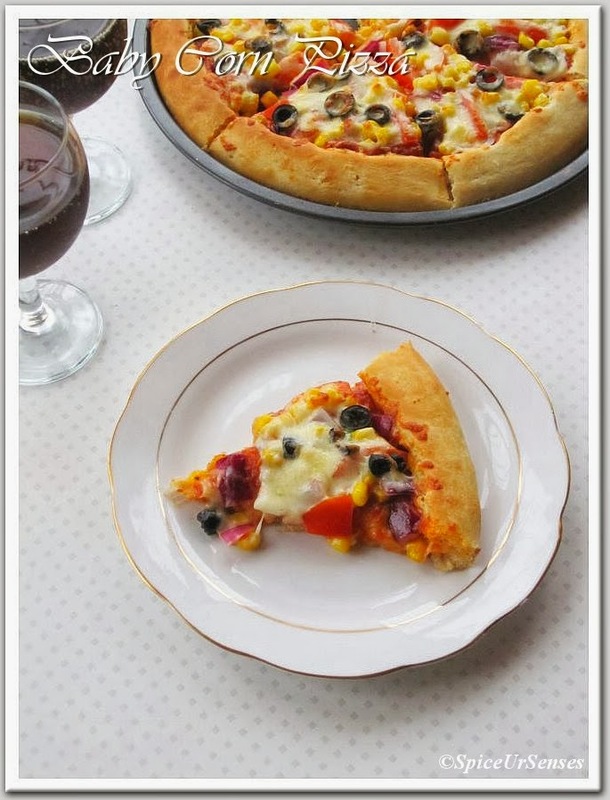 Arrange the pizza dough into a circle on top of the baking flat tray. Leaving the raised edge uncovered, pour 8 to 9 tsp of the pizza sauce onto the dough. Using the back of a tablespoon, evenly spread the sauce leaving a half-inch border of dough uncovered. Arrange half of the mozzarella slices on top of the sauce and arrange all the veggie's on top, then cover with left over mozzarella slices. Bake until the crust is golden brown and crisp on the edges and the bottom, 7 to 8 minutes, turning the pizza halfway through baking. Using a pizza wheel, slice the pizza into eight pieces, and serve immediately. Sauce is ready to use, after using the sauce to pizza you can store the remaining sauce in a fridge for the next time use.. Very delicious and Tempting Pizza...Loved the toppings and pizza sauce too....yummmmmmmmmmmmm! so perfectly done, dear...lovely pizza. Love the colour and cheesy crust,seriously makes me drool, fantastic pizza. wow very cheesy and delicious pizza :) so perfectly made loving it !! Hi - Can I store the pizza dough in the fridge for later use?